The way the police persistently label opposition to fracking as “extremism” infuriates campaigners up and down the country. The National Police Chiefs Council NPCC), which represents senior police officers in the UK, will shortly consult on how local forces should in future plan policing operations in response to protests against fracking – one of the most contentious public order issues of the last five years. When the consultation, which Netpol has pushed hard for, is finally launched in the coming weeks, one issue it cannot ignore is the persistent labelling of the anti-fracking movement as “domestic extremists”. In December 2016, the Home Office was finally forced to issue a statement saying “support for anti-fracking is not an indicator of vulnerability” to extremism, after press coverage about City of York Council and a school in North Yorkshire including anti-fracking campaigns in their counter-terrorism advice. Smearing campaigners in this way had not, however, simply appeared out of thin air: it has been part of the constant messaging promoted by counter-terrorism policing units from around the country for many years. At this stage, counter-terrorism officers in Sussex were still obsessively searching for “extremists” within anti-austerity campaigns in order to add their details to secret police databases, but as the movement against fracking began to grow rapidly, it too was increasingly targeted for surveillance. In November 2013, a Cambridgeshire Police officer was caught on camera trying to recruit a student to inform about a number of groups, including anti-fracking demonstrators. In 2014, a poorly redacted external review of the extremely violent policing operation over almost 70 days of protests against the drill site at Balcombe the previous summer highlighted the development of a UK-wide policing strategy and recommended that “lessons learnt” should be “fed into the emerging national coordination on fracking”. Its emphasis on expanding the intelligence-gathering role of Police Liaison Officers features prominently in new guidelines for local forces issued in August 2015, which the NPCC is now about to consult upon. 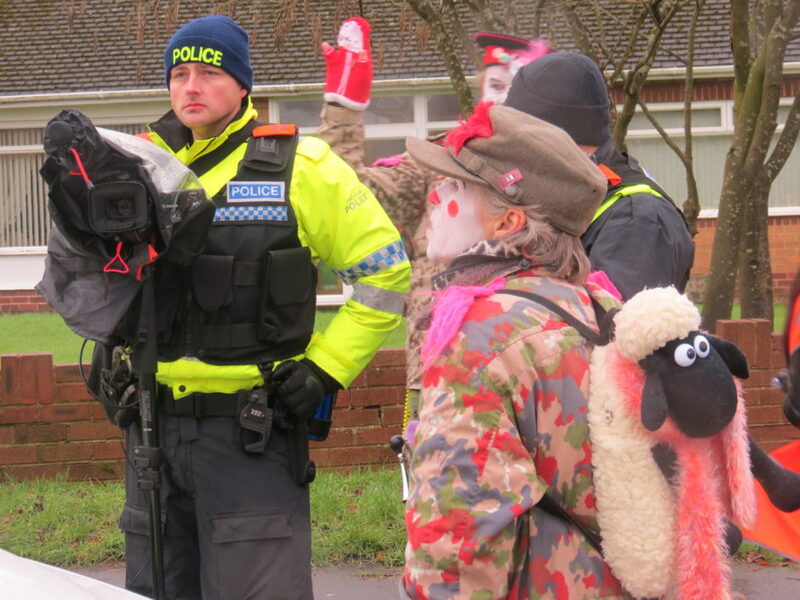 Since then, our work has highlighted the targeting by counter-terrorism officers of a journalist covering anti-fracking protests in Lancashire and of the mother of a young campaigner who took part in protests against shale gas exploration at Crawberry Hill in East Yorkshire. In 2015, two anti-fracking activists from the north west of England told us they had been referred to the government’s “counter radicalisation” programme, Channel, because of their political opposition to onshore oil and gas extraction. This is now the subject of a three-year legal battle by Netpol against the Information Commissioner to try and obtain statistics about how often such referrals involve anti-fracking campaigners. At around the same time, we were given an audio recording of a training session that provided concrete evidence that counter-terrorism officers from Merseyside Police were linking anti-fracking protests to “domestic extremism” and making unsubstantiated claims about campaigners who took part in protests in 2014 at Barton Moss in Salford. This corroborated earlier testimony that police in West Yorkshire told hundreds of teachers to consider environmental activists and anti-fracking protesters, including the Green Party MP Caroline Lucas, as potential extremists. The newsletter issued by Driffield School in North Yorkshire that told parents that “East Riding’s main priorities are far-right extremism, animal rights and anti-fracking” was issued in June 2016 (it has been removed from their website but is available here [ , 398 kB]). Even after the Home Office backed away in late 2016 from claiming a link between anti-fracking protests and extremism, however, police continued to repeat it. 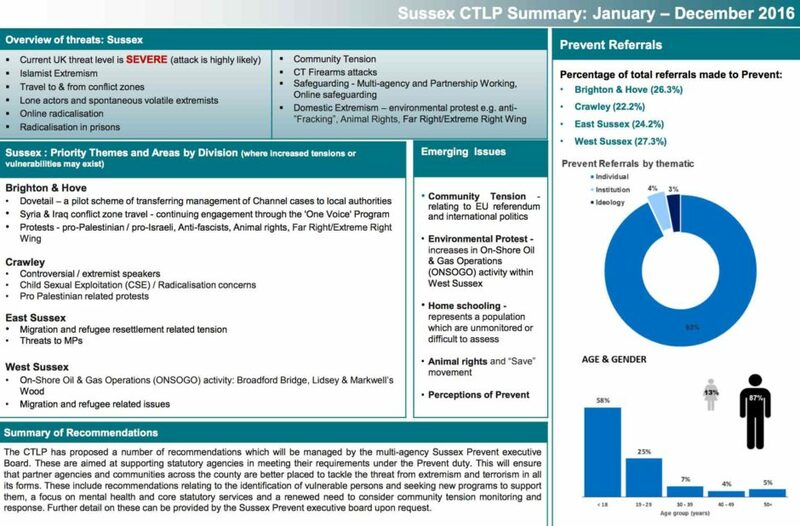 In September 2017, ‘Counter Terrorism Local Profiles’ developed under the government’s Prevent strategy were released that identified protests at Broadford Bridge in Sussex as a “priority theme… where increased tensions or vulnerabilities may exist”. A similar profile for Surrey highlighted “community tensions related to onshore oil and gas operations” in the east of the county. The Broadford Bridge protests did not start until April 2017, four months after the Home Office’s statement saying opposition to fracking was not a “vulnerability”. We know this issue really infuriates campaigners up and down the country. In the course of preparing for our forthcoming legal challenge against the Information Commissioner at the First-tier Information Rights Tribunal, we asked people to tell us how they felt about the police describing their campaigning as “extremism”. We were inundated with responses describing the cross-section of support the anti-fracking movement has attracted and how divisive and insulting it was for the police to even suggest individuals might become ‘at risk of being drawn into terrorism’. This is why the National Police Chiefs Council consultation cannot avoid this issue. Characterising participation in legitimate campaigning as “extremism” has been used to justify increasingly intrusive surveillance and these subjective judgments may have directly influenced the way the police have treated protesters, often extremely aggressively, at drilling sites. It may also have led to the wholly unreasonable deployment of undercover officers for infiltration and disruption of local campaigns, a prospect that the NPCC refused to rule out in 2016 when it said that “any tactic, including covert tactics, is for the policing commander for the operation”. This issue is fundamental to the breakdown in relations between local campaign groups and the police and no amount of reassurances about improved communication will fix this. It remains a simple but fundamental fact that there is no evidence whatsoever of any link between anti-fracking campaigns and extremism, never mind a risk of “terrorism-related activity”. There is simply no reason for counter-terrorism officers to view anti-fracking protests as a priority for the government’s Prevent programme and no reason for the police to target protesters for “domestic extremist” surveillance. New national police guidance, when it is eventually published, must recognise this if it has any hope of changing the conduct of future policing operations so they genuinely respect people’s rights to freedom of assembly. Netpol plans to advise and support campaigners on how to ensure their views are heard in the National Police Chiefs Council consultation, once it is launched. Subscribe to our newsletter to stay in touch. Since the majority of people in the UK are against fracking, they cannot by definition be called extremists; they are mainstream.